My work is crude and amatuerish in comparison, but I think I’m getting a better handle on it. But making them is only half the job. They need to be distributed too. So I’m thinking I will plant them around Niagara Falls next week when I’m at the Open Ed conference. I needed some sort of card to go with them, so I guess I gave myself a design assignment. 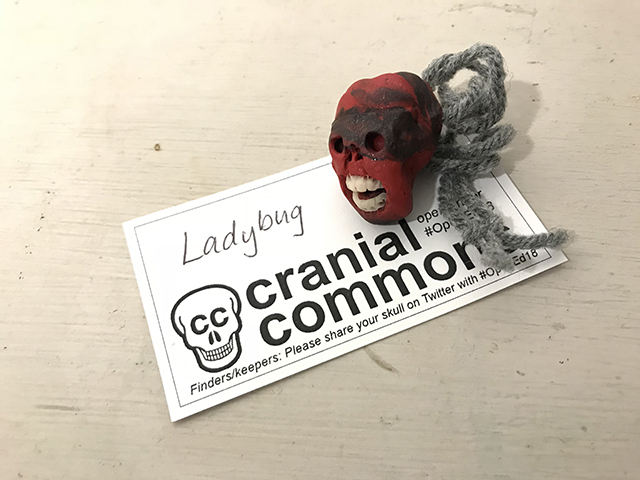 In keeping with Open Ed, I wanted to play off of Creative Commons, so I thought of “common craniums” or “cranial commons.” Common craniums balanced well – both words come out almost the same length – but my creations are a bit to mutant to be called common. 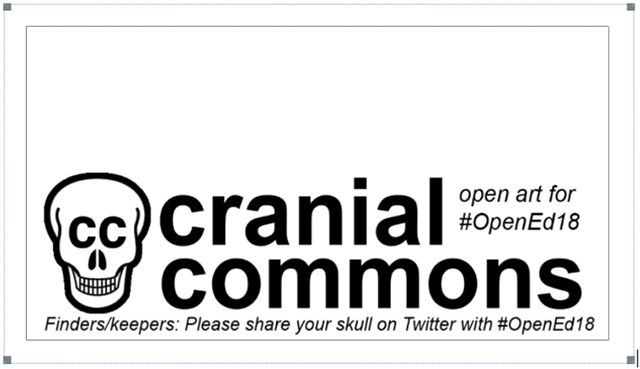 Cranial commons leaves a little room to fit in a tag line, “open art for #OpenEd” or something like that. Then I had to do something with the CC logo. I googled “skull logo” and set the image filters for white color and “labeled for reuse.” I found one from Wikimedia Commons, which is perfect both in spirit and for my purposes. Using Photoshop, I replaced the skull eyeholes with the double c of the Creative Commons logo and applied a stroke to the outside edge of the logo to more or less match the weight of the stroke in the type. It’s pretty far removed from the CC logo, but I think it works well enough. I used Helvetica Bold for the typeface, like in the CC logo, and put it on a business card template. And I’ll leave them around for people to find. It’s close enough to Halloween so people may like it. Some people will no doubt find them hideous. But perhaps the right people will appreciate it. We shall see. The setting and the timing make it a nice little public art experiment. Hopefully the maintenance people won’t just throw them away. This entry was posted in Uncategorized and tagged openart, opened. Bookmark the permalink.